June 21: The expected release of an elderly Pakistani academic imprisoned in India for nearly two decades was delayed as the Governor of Rajasthan raised further queries instead of signing the mercy petition recommended to him by the Chief Minister of Rajasthan – flouting the constitutional provision that requires the Governor to act upon the advice of the Chief Minister, making his signature a mere formality. After Dr Chisty’s bail application was rejected by the Rajasthan High Court (which stated that as a Pakistani national “no leniency” could be shown to him), his daughter Amna Chisty in Canada began writing to various authorities in India, including the Chief Justice of India, Chief Justice of Rajasthan and Law Minister, urging them to look into her father’s case. This prompted an inquiry that led to the case, pending for 19 years, being brought before a trial court in Ajmer that in Jan 2011. 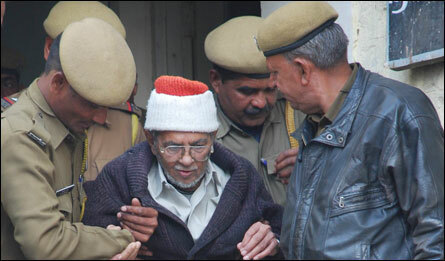 The court convicted Dr Chishty of murder and sentenced him to life imprisonment (14 years). With Dr Chishty’s failing health generating fears that he would never reach home alive, Amna Chishty appealed to Aman ki Asha, a joint peace initiative in Pakistan and India, “to bring his plight to the forefront like it campaigned for the Indian prisoner (Gopal Dass) recently released by Pakistan” in response to an appeal by a bench of the Indian Supreme Court. Dr Chishty had already spent nearly two decades imprisoned in India, either in jail or under strict surveillance at his ancestral home near Ajmer. A heart patient, he also has an unhealed hip fracture due to which he can no longer walk on his own, as detailed by Amna Chishty. Human rights activists, journalists and lawyers in India responded to Amna Chishty’s appeal publicised by Aman ki Asha. Prominent Indian citizens wrote to the Indian President as well as to the Governor of Rajasthan in April 2011, whom Mahesh Bhatt and Kuldip Nayar even met in this regard, urging Dr Chishty to be freed on humanitarian grounds. “Our inquiry reveals that he was falsely implicated,” says a petition signed by journalists Jatin Desai and Kuldip Nayar, filmmaker Mahesh Bhatt, retired Indian Navy Chief Admiral L Ramdas and People’s Union for Civil Liberties (PUCL) general secretary, Kavita Srivastava. Due to their efforts a process to release Dr Chishty was initiated. Meanwhile, Dr Chishty’s family filed a Human Rights Petition with the Supreme Court of Pakistan urging the government to intervene and resolve the matter through diplomatic channels and appeal to the Indian government to release Dr Chishty on humanitarian grounds, as the Indian Supreme Court had appealed to Pakistan in the case of Indian prisoner Gopal Dass. On June 15, the Pakistan Supreme Court rejected the petition on the grounds that the government was already doing all it could and further, it had “no jurisdiction” over India – a point that the Indian Supreme Court had also raised in the Gopal Dass petition, while still appealing to the Pakistan government for Dass’ release “on humanitarian grounds”. Pakistan had responded promptly and released Dass, who is back with his family in India. “I am not commenting anything on the merits of the case as it is a judicial proceeding. However, apart from the judicial proceeding there is the executive power in the President and the Governor to grant a pardon,” wrote Justice Katju. “It has been held by the Supreme Court in Nanavati vs. State of Bombay A.I.R.1961 S.C. that pardon can be granted even when a case is pending. A day after the Prime Minister of India took note of this appeal, the Chief Minister of Rajasthan signed the mercy petition that had been pending before him for the past ten days. The process was expected to come to an end today with the Governor of Rajasthan completing the formality of signing the appeal. Several media outlets had in anticipation already reported that the “deck is clear” for Dr Chishty’s release. However, instead of signing the petition, the Governor sent a long list of queries to the Rajasthan Home Department, including questions about why the trial took so many years. “This means that it will take longer, till that information is not collected and sent back,” says Kavita Srivastava, General Secretary of PUCL. According to legal experts, the Governor’s refusal to sign the mercy petition recommended to him by the Chief Minister, and practically sitting as a Court of Appeal over this recommendation, is “totally unconstitutional”. India’s Constitution states that in the matter of granting pardon, the President or the Governor must act on the advice of the government, and not at his or her own discretion. However, activists remained determined to continue their efforts to release Dr Chishty. “We are not going to be demoralised and will continue working for Dr Chishty’s release and sending him home,” says Kavita Srivastava.